"Any crime-fighting gadgets, invisible jets, or suits of armor he has bought with this money will be repossessed, and he will work off the remainder of his loan as a member of the Paybacks. That's us, by the way. Hi." Putting your life on the line for a city as a superhero certainly isn't easy. You're forced to contend with villains seeking to kill you and innocent civilians struggling to understand you. You're also dealing with the rigors of daily life, including eating, sleeping and bills. The latter of those get the humorous treatment in The Paybacks #1 from Dark Horse. The issue is written by Donny Cates and Eliot Rahal, illustrated by Geoff Shaw, colored by Lauren Affe and lettered by Michael Heisler. Heroism doesn’t come cheap, so when superheroes borrow money to finance their genetic enhancements or crime-fighting supercomputers, their debts make student loans look like IOUs! 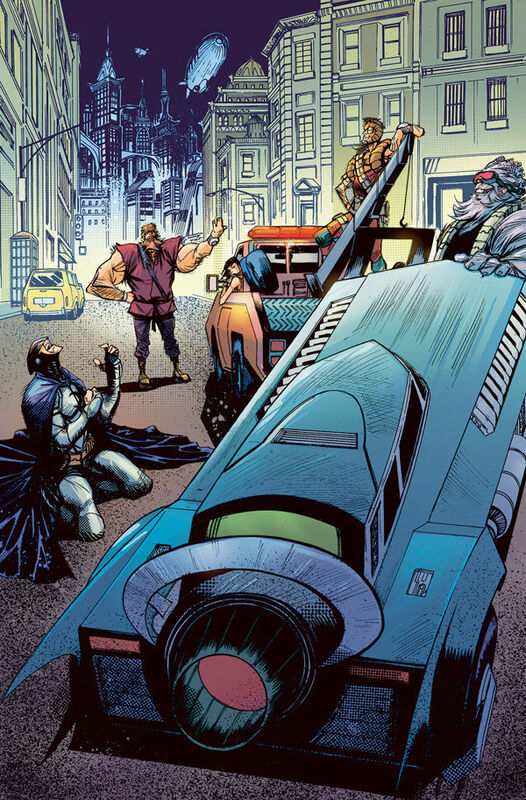 Enter the Paybacks, a repo squad composed of bankrupt former heroes here to foreclose on everybody’s secret lairs! If you can imagine bankrupt superheroes working off their debts by collecting the possessions of other bankrupt heroes, then you're pretty far along in The Paybacks #1. Cates and Rahal have crafted a story that's immensely entertaining, if for nothing else because the superheroes are forced to contend with the bureaucracy of the laws they fight to uphold. The tongue-in-cheek approach to superheroes feels similar to that of The Tick, with characters who think way too highly of themselves and aren't immune to things like taxes and debt. Cates and Rahal rely on immensely entertaining banter among the Payback teams as they struggle to complete their assignments. The dialogue just feels like the writers are having a good time with the book; something that trickles down to the story as a whole. Buttressing the irreverent tone of The Paybacks #1 is Shaw's illustrations, which are caricatures in themselves. Many of the superheroes maintain a heroic stature when in costume, but when Shaw illustrates them as civilians, they show signs of being worn down. Shaw relies on cross-hatching for some of the characters and settings that add a scratchy quality to the work, reminding the reader of the gritty world the superheroes live in. There's also a frenetic energy to the panels that reinforce the notion of the superheroes as reckless and willing to put their health on the line in the name of their self-preservation. And Affe's colors are grimy, dwelling primarily in darker colors that match the more mature mood of the book. The Paybacks #1 is a lot of fun. The concept of superheroes still having to pay their debts humanizes them and adds another layer to their complexity, which is made even more amusing by the concept of a group of bankrupt heroes going after other bankrupt heroes. Cates and Rahal have crafted a story that shows they were having just as much fun crafting it as the reader will likely have reading it. Shaw's illustrations are dark and striking, offering a glimpse at a variety of different looking superheroes. The Paybacks #1 is definitely worth checking out because of the exceedingly amusing tone and exchanges between the characters. The Paybacks #1 is in stores September 16.